Walking through Hongkong you might expect to be able to visit many spots which are linked to our martial art Hung Kyun. In reality this is sadly not the case. Usually the school of a sifu who passed away will be closed. Also ground and building prices are very high in Hongkong, leading to the demolition of many old building to make place for modern highrise. The exception is the building that is known as the ‘Blue House’. 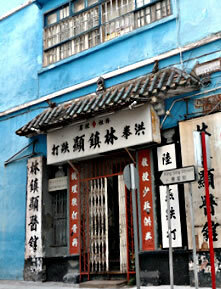 The Blue House is situated on Stone Nullah Lane, in the district Wan Chai on Hongkong Island. Wan Chai is a busy commercial area with many small to medium sized businesses. It is in development since 1850. Wan Chai translates to cove, a small indentation or recess in the shoreline. The cove does not exist anymore. Regularly land is reclaimed from the water as building ground is scarce in Hongkong. Over time, the cove completely disappeared1. The Blue House has four floors and has the classification Grade 1 Historic Building2. This classification has the following meaning; “Buildings of outstanding merit, which every effort should be made to preserve if possible. ” It is built in 19233, and is largely made of wood. It is one of the few pre-war buildings still left. Many modern conveniences have not been added. It does not have streaming, hot water, not connected to the waste-water system and human waste needs to be flushed with buckets of water through a gutter outside the building. At night this waste is collected by the city waste management. All inhabitants share one communal kitchen. The history of the building in relation to Hung Kyun has many uncertainties. Many people say for example that Lam Sai Wing already had a school in this building. This is even mentioned on an information-board close to the building. But, it is more probable that Lam Sai Wing had a school in the same area that since has disappeared. Without doubt his nephew and student Lam Cho started a school and ditda4 clinic in 1950’s5. Later, the school was used by his son, Lam Chun Hin. He was especially interested in kungfu, but sadly died young from cancer. His widow runs to this day a ditda clinic in the building. Panorama of the Blue House, 2012. Click to open an interactive virtual reality view (new window). The fact that the building has a Grade 1 Historic Building classification does not give any guarantees for the future. During the last twenty years five buildings with the same classification have been demolished. The future of Blue House looks better however. A restoration was finished in 2011 worth 100 billion Hongkong dollar. It contained nine characteristic buildings in Wan Chai, including the Blue House. The International Guoshu Association made a proposal to reform the building into a center for kungfu. Sadly this proposal has been turned down. It proposed a modern facility for teaching traditional kungfu, backed up by modern science. It included a library, museum and a multifunctional movie- and lecture room. The neighboring Yellow House was included in the plans offering a teahouse and a kungfu themed restaurant. Despite this proposal being turned down it looks like the history of this building is ensured. This is not only important for us martial artists, but also for Hongkong’s heritage itself. A piece of Hung Kyun history remains in reach. On RTV Hongkong this item was aired. The school is not shown, but briefly mentioned. About the author: Jeroen Kloppenburg has over 30 years experience in martial arts, with the last ten practicing Hung Kyun. He is a student of sifu Ng Bing Kuen and sifu C. van ‘t Slot. Since 2009 he teaches Hung Kyun in the city of Deventer, the Netherlands. 1) More information on Wan Chai, with an animation showing the disappearing of the cove. 4) “Hit and fall medicine”, traditional sports medicine practiced by kungfu masters. Often for their income, as teaching kungfu gave little, to no income. 5) Revitalization & Preservation, Hongkong Housing Society. « Czech Short Kung-Fu Movie “Wooden Dummy” Online! I have one big question left, maybe one of you could help answer it.. These colors to me look like something added after the 60’s, but I can’t find any specifics on that online, or by asking around. If you know more.. Finally, I would do justice by thanking Fan Kwoen for the historical information on the gwoon! Jeroen, nice article. You are right. The building was not painted blue at all until the 1970s for the purpose of using the building for a film shoot – called ’72 Tenants’ by Shaw Brothers Studio (released 1973). Henceforth, the building has been referred to as the ‘Blue House’. You are also quite spot on with regards to the names of the neighboring buildings. They are known respectively as ‘Yellow House’, ‘Orange House’ and “Green House’. The revitalizing historic buildings through partnership scheme offered the ‘Blue House Cluster’ – which included the Yellow and Orange Houses for renewal and revitalization. I can verify that Lam Sai Wing never took residence there, but Lam Cho moved into the Blue House after the war with his whole family, including Sifu Lam Chun Fai, who has vivid memories of the building. Some of his recollections are recounted in his latest book ‘Hung Kuen Fundamentals: Fok Fu Kuen’. I have a movie to watch! Thank you for drawing wider attention to the Blue House. It is one of the last historic buildings in HK with strong connections to martial arts. Excellent article, thx for sharing!